Rabbi Laura Geller celebrated her last weekend as a senior rabbi of Temple Emanuel of Beverly Hills in June. She's transitioning to a new stage of her life, and, like many retirees, spent years preparing herself financially, emotionally and spiritually. But unlike many of her peers, she did so with the help of more than 200 other people. Around four years ago, Temple Emanuel launched its Boomers and Beyond Initiative, bringing people in their mid-50s or older together to discuss their retirement-related fears and dreams. "We asked people about this new stage in their life with questions like, 'What are your concerns? What are you hopeful about?' Their fears were becoming invisible, isolated and dependent," said Rabbi Geller, 66, who will now serve as Temple Emanuel's rabbi emeritus. These initial conversations reinforced the rabbi's sense that older congregation members were in need of special attention. She and her colleagues began gathering retirees together to talk about creating meaning in their lives after their careers drew to a close. The Boomers and Beyond program is unique at a time when many faith communities are more worried about getting young people in the door than keeping older members engaged. More than 1 in 3 millennials don't identify with a religious group, compared to 17 percent of baby boomers, or people who were born between 1946 and 1964, according to Pew Research Center. "All the energy, funding and attention is on (attracting) people in their twenties and thirties," Rabbi Geller said. Religious leaders must learn to balance the needs of younger and older members in order to build thriving communities, congregational experts said. "The best way to serve children and youth is to have a vibrant, multigenerational community," said Rachel Bauman, the minister of community life at First Congregational Church of Berkeley. "That's also the best way to serve older folks." Additionally, faith communities are uniquely positioned to help people sort out life after retirement. The median congregation age in the U.S. was 58 years in 2012, according to the National Congregations Study from Duke University. "How do you make meaning in the face of the fact that you're going to die? That's what faith communities are supposed to be teaching people," Rabbi Geller said. When Richard Ziettlow retired, he looked forward to playing more golf. Four years later, he's met friends for many tee times, and he's still had time in his schedule for volunteering. Ziettlow has served at food banks, community parks and a National Youth Gathering for the Lutheran Church. He now leads the Main Street Program in Le Mars, Iowa. "My wife says, 'Good thing you're not working, you wouldn't have time for all these programs,'" said the former Hewlett-Packard employee. Ziettlow, 67, embodies the spirit of giving that faith communities are used to finding in their older members. People ages 50 to 80 often compose the core leadership, joining committees and staffing service projects. "Most of them are in (the congregation) for the long haul," said Edward Hammett, a church consultant and author of "Reaching People Under 30 While Keeping People Over 60." In the Church of Jesus Christ of Latter-day Saints, senior missionaries, or couples who volunteer to serve full-time, constitute 8 percent of the church's missionaries. Around 6,000 retired couples currently volunteer their time around the world, and many more take on part-time projects near their homes. Because older congregants are often quick to volunteer their time and energy, it's tempting to assume that members of this cohort are satisfied with what the faith community has to offer and not worry about them until they're in a nursing home and need visitors, religious leaders said. But life after retirement is daunting, especially now that Americans live up to three decades longer than they used to. Older church members need their faith community's help to get the most out of their final decades, Rabbi Geller said. When Temple Emanuel began its "conversation campaign" with older members, leaders learned that concerns about aging fell into four key areas: spirituality, community life, giving back and family life. These parishioners wanted help navigating the major life moments that follow retirement, such as a partner's illness or moving out of their long-term home. Initial discussions led to small group meetings. 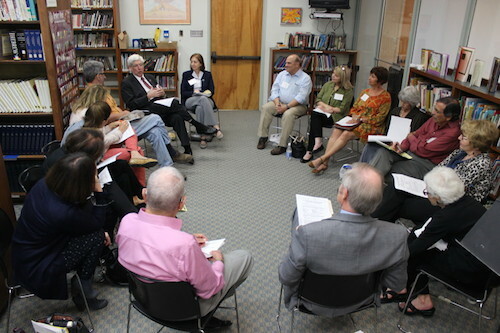 Members signed up for 10-person study circles to discuss growing older. They were supposed to meet four to six times and then split up to form other groups, but they grew so attached that Rabbi Geller is now scrambling to ensure everyone interested has access to a small group. "The conversations were so rich and powerful that nobody wanted them to end," she said. These group discussions have led to new activities, such as community walks, bridge parties and gardening. They've also inspired even more conversations, as older synagogue members meet with their family to discuss their end-of-life wishes and fears. "It was wonderful for us and for our kids," Rabbi Geller said. Although some faith communities don't have the resources to create an extensive network of events, programs and community discussions for older members, it would be relatively easy to ask members who have already retired to mentor people who are approaching retirement age, Ziettlow said. "You're not creating anything brand new, but pulling together the pieces that are out there," he said. However, retirement-related programming is not the only area in which faith communities might fall short in terms of serving older members. For example, Bauman worries that her leadership team's increased focus on social media outreach to attract young adults might not be valuable for older members, who are less likely to care about Twitter or Facebook than people in their twenties and thirties. "We're continually trying to figure out … how to not leave people behind," she said. Hammett, who has consulted with church leaders from 18 different denominations, said the needs of older and younger church members often come into conflict during worship. Members of different generations sometimes disagree on music styles and the tone of the service, for example. Squabbles over which songs to sing and whether to use an organ or piano can evolve into larger debates over what church is meant to be and how best to build a community, he added. If religious leaders are worried about keeping younger members active in the community, they may side with them at the expense of older members. "There's not a forum out there that's natural and comfortable and nonthreatening for every age group" to share their concerns and discuss solutions, Hammett said. Additionally, conversations about the future of a faith community sometimes leave older members feeling worried that they've failed to keep a church healthy, said Amy Ziettlow, who is the pastor of Holy Cross Lutheran Church in Decatur, Illinois, and Rich's daughter. Some of her congregants struggled to accept that their church needed to combine with other local groups for summer programs because of a shortage of kids active in the church. "Instead of a fear of difference, it's more of a sense of failing. They think, '40 years ago, we had Vacation Bible School every summer and 10 kids in every Sunday School classroom," the Rev. Ziettlow said. In spite of these potential roadblocks, faith communities should embrace opportunities to engage retirees in new ways, Rabbi Geller said. "Investing in this cohort is not only good for the cohort, but also for the institution," she said, noting that the Boomers and Beyond Initiative has helped Temple Emanuel, attended by more than 750 families, feel like a much smaller, tight-knit community. People who have met at group discussions now sit together during worship, instead of staying isolated by family group. Research has shown that teens and young adults benefit from bonding with older church members, noted Melinda Denton, an associate professor of sociology at the University of Texas at San Antonio. Using data from the National Study on Youth and Religion, she determined that cross-generational relationships encourage young people to stay involved in their faith community. "We came away from that study recognizing the importance of adult mentors in the lives of adolescents," Denton said, noting that congregations should resist the temptation to isolate young people in youth groups and other age-specific ministries. Bauman takes research like Denton's to heart when she reflects on congregational life in her church. It's easy to get distracted by efforts to attract younger members, but she tries to remember that older members have an essential role to play in a healthy faith community, she said. "The Apostle Paul has a whole piece around the body of Christ. If everyone was an eye, where would the sense of hearing be? If everyone was a nose, where would the sense of touch be?" Bauman noted. "We would be so much less of a community if we didn't have every age." Older members are an important source of wisdom, she added. "What does it mean to be a faithful person your whole life, through the death of a spouse, the death of a child, your body betraying you? What does it mean to continue to live the life of faith? To not have that, we would be so impoverished," Bauman said. Temple Emanuel's efforts to engage retired members have taken some unexpected but rewarding turns. Rabbi Geller has been rethinking Jewish rituals, looking for ways to mark important moments in the lives of older members, such as becoming a grandparent or the death of a spouse. Typical life cycle rituals, such as a baptism, bar mitzvah or wedding, happen early in people's lives, and there's a gap between marriage and death where people may not feel celebrated within the faith community. "What's the prayer that you say when you close up your parents' home or move them to a nursing home? These are the kinds of questions we're asking," Rabbi Geller said. Faith communities should also be asking retired members to think about what career-related skills they'll carry over into life after retirement, Ziettlow said. Just because someone stops reporting to a job every day doesn't mean they'll lose the ability to mentor others. "Find a way to plug in their skills to something else. Even more importantly, find out what they're interested in and try to get them involved," he said. Retirement is an opportunity to dive into new adventures, even if people need a little nudge to see it that way, Ziettlow added. "If I were to design a 'retirement ritual' for the church, it would be a series of social activities, workshops and Sunday School classes for (someone) who is looking ahead at retirement," he said. It'd be focused on the question: What do you want to be when you grow up? Rabbi Geller already knows the answer to that question, thanks to years of discussion with her congregants. "I am already starting my encore career and continuing this piece of the work. I'm going to continue to do what I'm doing around these issues of growing old and not anything else," she said.